Our Fashion Editor, Rachna Bhatt, connected with designer Gaurang Shah to bring you the latest in wedding looks for the fashionable bride and groom. 1. What was the inspiration for your latest collection? Our latest collection is inspired by Vrindavan, an ancient temple city: rich, handwoven heritage with bold patterns and classic cuts that reflected traditions of India. The range was inspired by textiles from around the country, such as organza, khadi, silk, and matka silk. The Vrindavan Collection is an eclectic range for the modern day bride in varied silhouettes like lehngas, anarkalis, kurtas, ghararas and heritage saris. The collection includes a menswear line like chikankari kurtas, Benarasi jackets, plain matka kurtas, patanpatola pagdis with kanjeevaram and embroidered dupattas. Fashionistas can look forward to something even more enchanting as re-create chintz in print, hand-painting, embroidery, and weaving. 2. What's the secret to using traditional textile styles in contemporary looks? Some of the most experimental textiles come from inspiration, such as nature, architecture, the fine arts or contemporary culture. The traditional textiles are the foundation for creative patterns and unique fabrics. 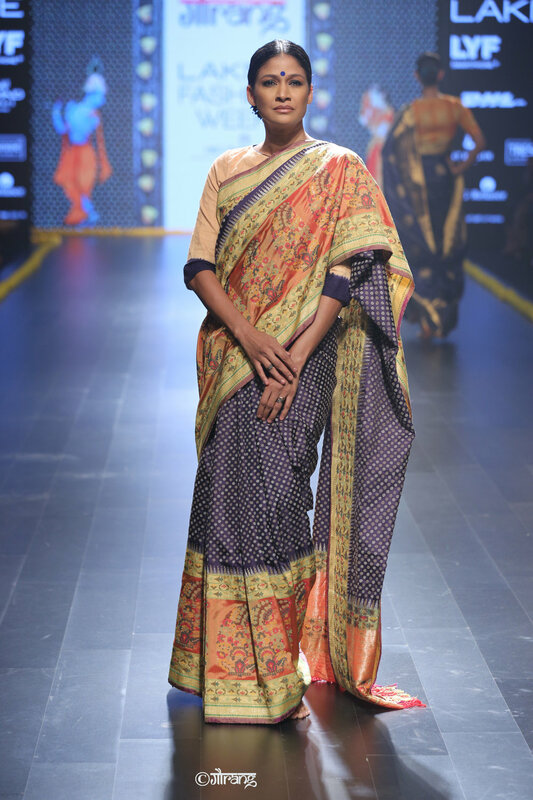 Using the Jamdani weaving technique we have created amazing textile fusion that incorporate the past, blending beautifully with modern fashion aesthetics. For example we have a line of saris that are lighter but have the lustre of silk, such silk and organza blends, which allows for effortless draping. So far, our label has introduced ethnic weaves from several different states like patola silk from Patan, bandhini from Kutch, korvai weave from Kanchi, jamdani in Benaras and Paithani, matka silks, tussars and khadi. Vibrant colors inspire brides and bridegrooms to make their own fashion statement. 3. What are the bridal trends you are predicting? For the stylish groom, the khaadi Jamdani achkans, Kota kurtas teamed with Patan Patola shawls, are sure to be the latest in wedding looks. The Kanjeevaram kurta paired with a Paithani is also a must-have trend. For the bride, our favourites are Jamdani handwoven heritage saris, traditional ghagras, swirling anarkalis and floor-skimming lehngas in yellow, powder blue, sea blue, mint, green and white. We have introduced unconventional color combinations to provide additional options to the traditional bridal color palette. 4. How can brides access the collection? We ship internationally and can be contacted via email, website and whatsapp.